The Tasman penninsula is a bit of land one the southeast side of the island. It was used as a maximum security prison in the 1800s. There were no walls as the only way off is through a small point of land that connects the penninsula to the island. 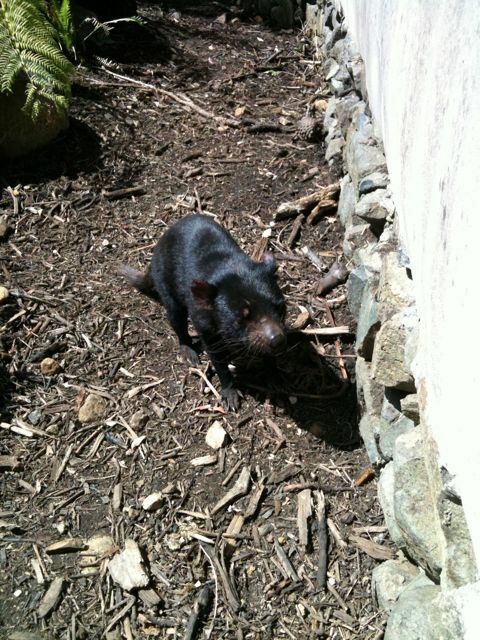 We first stopped at a Tasmanian devil refuge. We saw devils , kangaroos, and wallabys. A highlite was being able to feed the kagaroos right out of your hand. I miss stu. We then went to port Arthur which is the main site of the prison. It’s a little like alxratraz as you are walking around a delapitated area. However this was beautiful location. A little port of water and a big green area of grass. I am sure the weather isn’t always 75 degrees and sunny, but it was not a bad place to be. Finally left Hobart today. We went down southwest from the capital to go for a hike. We started at some foresting area (where they told us they were planting our future — how nice since they just cut it down) where we saw our first wild wallaby. He hopped right by. We then decided to start the hiking. 5 miles with an elevation gain of 1000 ft or so. This is a little shorter than the first day of overland so a good way to start. Of course we had no packs as this was a day hike. The hike lead us to the top of the highest hill in the area. Luckily a family was there and the parents explained what all the surrounding mountains were. Just to our south where jagged hills that fell to the sea on the other side. From there the next stop was antartica. Arrived Monday to find mike Winstandley at the hotel (no beer in hand, but that was quickly rectified). We have a month here together to see the sights and do the overland trek. Mike mast will be joining us in two weeks for the trek. Until then mwinstan and I will be taking a car around the island and seeing/hiking as much as possible. Monday and Tuesday we spent in the state capital of Hobart. Not much going on. 200k people only. We did eat some good Indian food. We used the days to prepare for our trip by getting a cooler, gas for the cooker, etc. We did try to drive to mt Wellington (the local highest point) butof course it was fogged in when we got there. Not much to say today. We got up early, 7, and headed home. We dropped off all of our stuff at home (its AMAZING how much crap we had in the RV) and with the help of Mike Winstandley (who was house watching for us), we cleaned the RV and returned it. A final day of driving brought us from the National Park to Jim and Janet’s house in Berkeley. We slowly made our way into California, once again arriving in the state we live. We drive by Mount Shasta (home of many a Houseboat trip), past Weed California (which always brings up thoughts of Terry McDaniel), and arrived at J&Js in time for dinner. Today was exciting because we got to see yet another National Park. Crater Lake is in Oregon and is a lake that has formed inside a volcano which has no top. No water leaves the lake, and there are no rivers out of the lake. The water is a crazy blue color (hard to see in photos) that you have to see. It’s not a large NP. In fact we saw most of it in one afternoon. We both would like to come back and take a boat ride, as we arrived to late in the day this time. Awaking in the park it was a good but sad day. We had to say goodbye to my parents who were flying home. We had a nice birthday breakfast (even though I really don’t like breakfast) and dropped them off at the Glacier airport. From there Susan and I drove through Idaho and into Spokane, WA. We were all excited to try the Spokane wine region and quickly got off the road and found our first Winery. The whites were quite good. We then tried to find other wineries. Number two was interesting in that it was in an old school house (see picture). From there however we realized that the Spokane Wine Region is really just wineries spread our all over downtown Spokane. Not the best for those of us driving RVs. After trying to find our way to a few more, we decided it was simply not meant to be. We headed on to Oregon. Our stop for the night was an RV park right on the Columbia River (Columbia separates Oregon from Washington and is the river that Lewis and Clark took to the Pacific). We had a wonderful overlook of the river, a nice simple dinner of Taco Bell, and enjoyed the scenery. All in all a good birthday…. Today we took the Red Bus Tour of Glacier. This is one of the most beautiful parks I have been to. Not a lot of animals, however the scenery is awesome. The red buses have been around since the 30’s in the national park. The roof of the bus comes off and gives you a convertible like feel. We took the road-to-the-sun tour where we were taken over the 6000+ center of the park. There is a 21 foot limit on cars for this pass so the RV was definitely OUT. We ended the day at a rib place where we ate 4.5 pounds of Baby Backs for dinner…. We awoke from our overlook of Flathead Lake and slowly moved on to Glacier. We started by throwing the dog in the lake for a while, then went wine tasting at Mountain Winery (also on the lake). We headed into Glacier to get the lay of the land. tomorrow we have a guided tour of the park. It seems that cars longer than 21 ft (ours is 25) can’t go over the pass. O well we wanted to have someone explain to us the beauty of the park anyway.